This year's Comic Con is ongoing, and our very own Ray Wert is stalking and all manner of film cars (and stalking Seth Rogen), which has us wondering: what's your favorite movie car? We're partial towards the A-Team van, but we're not sure how the A-Team remake will turnout and we're worried they're going to ride around in a Routan or something equally as despicable. If we have to choose just one, we're going for an ace-in-the-hole like the 1977 Pontiac Trans Am from Smokey And The Bandit. The black-and-gold paint still looks good today (inspired by the John Player Special Lotuses, no less). 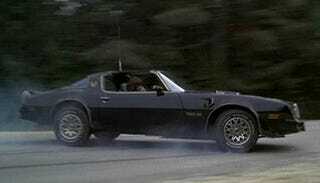 Unlike many of the Bond cars, Burt Reynolds keeps the car with him throughout the film as a trustworthy companion. It's able to jump over bridges, drive through roadblocks, and outrun the police without special gadgets. Not to mention, it'll allow you to pick up a young Sally Field. Need we say more?